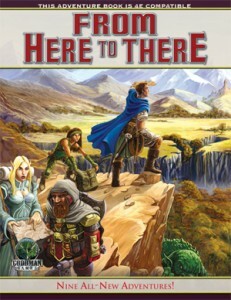 From Here to There is a Goodman Games anthology of nine mini-adventures for Dungeons & Dragons. At a range of levels (2-13), the common theme among them is travel. Each presents a unique obstacle to place in front of your players while they’re on the move.